Helen was just going out the door, a bit behind schedule and a little anxious about her upcoming meeting. As she left, I suggested that she take three deep breaths. That is often the same way I begin programs or talks I offer. People lead busy lives. They rush from one meeting to the next, one person to the next, one event to the next. Their bodies are in the seats, their minds are ready to be engaged, but they are neither relaxed nor open. I often begin such a program by asking the audience to close their eyes, and spend a minute just noticing their breath. In a few moments they also notice the quiet. Then I ask them to take a breath – hold it – and let it out with a sigh. Then take a second breath – hold it - and let that breath out with a sound that can be heard around the room. Finally, I ask them to take a third deep breath – hold it – and let that breath out with a sound that could be heard throughout the building. At that point, I invite them to open their eyes and begin the program. In that span of time the energy in the room has changed – and they have changed. They are open, more vulnerable, more available, more attuned to use their creativity. With the in-breath starting at the belly and filling up the chest cavity, more oxygen is carried to the lungs and the brain, and that in turn triggers the parasympathetic nervous system, which releases endorphins in the brain and allows us to feel more relaxed, reduce stress, lower blood pressure, and slow the heart rate. Buddhist meditative practice achieved equivalent results. Over time, the relationship between Buddhist practice and the autonomic nervous system became better understood and we began understand that different practices yielded different results. In the first part of the twenty-first century, Herbert Benson, Harvard professor and author of The Relaxation Response, began to tease apart Buddhist practice and meditation to see which practices were more effective in awakening the parasympathetic system. At about the same time, Jon Kabat-Zinn was developing a Mindfulness Based Stress Reduction Program in which it was not necessary to be a practitioner of Buddhism to cause the body to achieve the same results. A secular approach adopting certain features of meditation was sufficient. Take three deep breaths is similar to a mantra, a reminder to slow down, balance our busy mind and overcrowded schedules. A mantra is just a vehicle that helps you access awareness of the choices you make so your life doesn’t feel like a run away train – because run away trains can end up as train wrecks. When I consider the phrase Take Three Deep Breaths, it reminds me that I am at a doorway. On the other side is balance, harmony, quiet. I may not live there – but I can visit either by revamping my schedule, practicing mindfulness meditation, or recognizing a behavior that is unsupportable as a dominant life pattern. At times, we suffer from larger traumas than just overcrowded schedules. In 2014, I was climbing a set of outdoor stairs of a café to get a cup of tea. My foot caught on the last step and, as though in slow motion, I tumbled over my body, straining the quadriceps muscles beyond their tolerance. I felt a searing pain and heard a rip of muscles. For six weeks I lived in a cast that went from my ankle to my hip. Schedules went out the window. The lives of those closest to me were disrupted as they sacrificed to help me cope with the recovery process. What hadn’t even been a footnote in my planned life became a dominant theme that trumped other plans. Take Three Breaths wasn’t going to be enough to accommodate a temporary – but serious – interruption in life and work styles. It was, however, a mantra, for reflecting on a limited but major life interruption for which I needed to make changes in my life pattern. Since there wasn’t much I could “do” right after the accident, I had time for meditation, for contemplation, and if I heeded the message, even for reformation. If I view this disease as my adversary, I am expending energy railing against an impervious force which is implacable, unrelenting, and continuous. When I view Parkinson’s as my “partner,” she will share her mysteries with me, inform me when she is quiescent and when she is active, when she is approachable and when she is dominating. If I can no longer do everything I formerly was capable of doing, I can still do most things well. I time my activities to coincide with medicines that are effective. I heed the common advice of every neurologist I have used to exercise regularly because that improves my quality of life, supports my health, and slows down the progression of my Parkinson’s. I choose to use the term “partner” instead of “adversary” to describe my condition, because we are going to be together for a long time. Limitations on my activities are done in consultation with the disease instead of fighting the disease. It strengthens my mental outlook for the long haul. There are times when anger prevails – but I work at keeping it contained so it does not become the dominant theme. Over time I have created a set of anchors. These anchors add to my stability and allow my intentions to be reflected in my actions. Although we humans share many qualities, we all have individual strengths and weaknesses. I offer the anchors that work for me today. Nothing is forever, so I remain alert to possible changes in these qualities. If my approach makes sense to you, perhaps you will consider what anchors add to your stability for now. The qualities I consider most important to maintaining a quality of life for me are discipline, gratefulness, mindfulness, and ultimately, acceptance. Discipline. Stretch but don’t break. Pay attention to how you feel – it changes day to day. I describe Parkinson’s as a Buddhist disease – because you must be present and aware all the time. Mindfulness. Remember the mantra to Take Three Breaths. Be aware that you can either be a role model for others or a dark cloud that sours relationships. Acceptance. We have no control over events that occur. But we do have control over our response to those events. 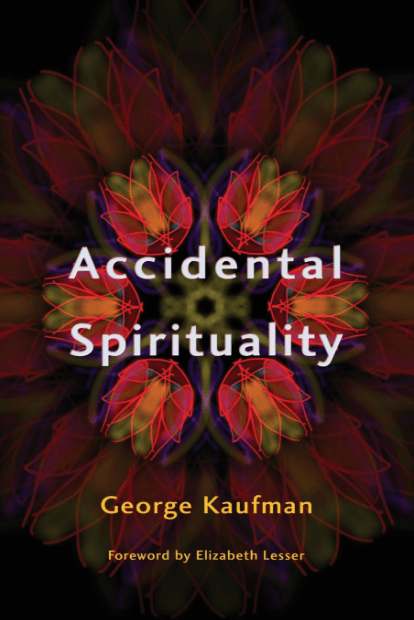 Download the first chapter of Accidental Spirituality as a free gift from George. as my free gift to you.